these arent my boards just some ideas. i also have an above ground trench set from www.armorcast.com that is now discontinued untill further notice, that at the first of the week i can take some pics of if interested and post, because i dont hink they even have the pictures archived anymore. Building them, what is the hardest part/what can go very wrong? 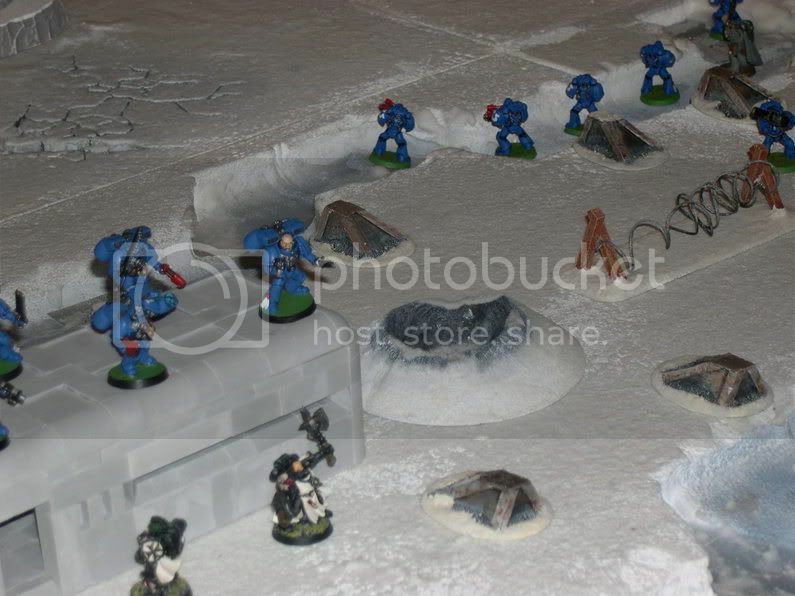 i made the terrain (but not the bunker) that is on the ice board. but, the trenches is not hard to make, you just have to have the right tool to make them all the same size and be carefull to match the squares up from board to board. if you plan to make it modular a torch wont work, too irregular in the melting process. if your serious about it and willing to purchase a good tool. check out www.hwff.com and check out one of thier small foam cutters they have, it has a stiff wire where you could form your trench and keep the same shape throughout. i have acess to one for when i want to use it and plan to buy one of thier sets later this summer. I may have something good and really easy laying around. You know that foam gw uses for making hills and practically all other stuff ? Well, make a low hill, not steep just a tiny hill. Than cut it in half, make the middle sections ( the side you cut ) as if it was dug out. Than put some rubble/stones/helmets/board/barbed wire/tank traps on the sides of the hill, against the wall. You could put the &#39;hills&#39; on a template but you could also don&#39;t do that, so you can make a long line of all the halves. Or adjust the trench if its to narrow. Now lets see if I got a picture somewhere. Its real easy, and if you detail it properly ( still on my to do list ) it looks real good. Note, still need to detail it. i havent made a trench system yet but i dont see how a modular board trench would be so bad, get ya board and glue slabs of about 1"thick polystyreen(sp?) the same dimensions as the board and then put the boards in place next to each other, take your blow torch as someone has suggested and use it to "cut out the shape then use a knife or HWC to detail the wall-age. hey presto. see if you dont screw it up, melting foam is not really a good technique when you have a shapeable wire foam cutter. and your doing away with the melted shape once you paint it. if you have something you can make a consistant shape with then your trenches will match, but then again if it dont really matter what it looks like, do whichever fancies your boat. 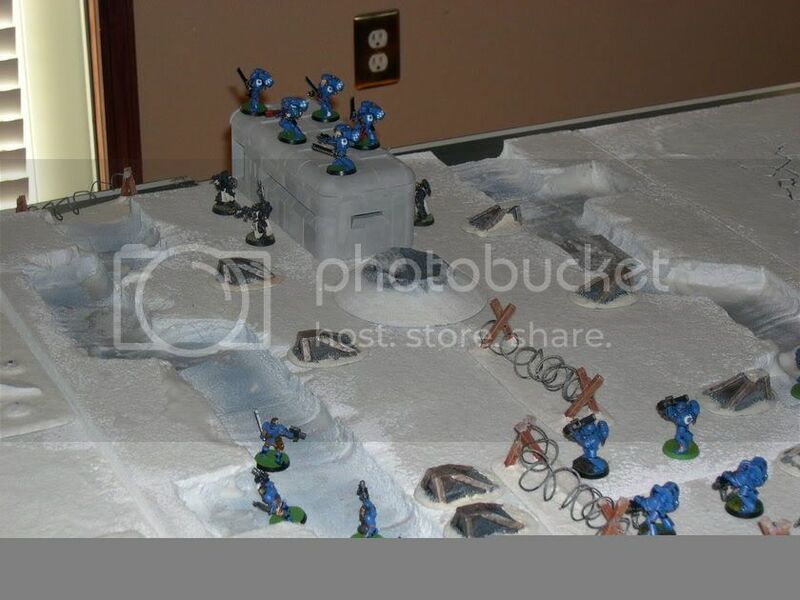 Google cache of some pics of modular trench terrain I worked on years ago.